« Scones for Breakfast or Tea in the Afternoon! Last year I was asked to take part in a Cooking Competition! I really do not usually participate in these kind of events, but a friend asked me to help her out and I accept the challenge. There were only three participants and I was one of them. It was quite an interesting and educational experience, I have to admit, even though it was more of an entertainment situation at a Wine and Food Festival at a local park….and not a professional event. We were three bloggers from around the Washington, DC and Baltimore areas. The tables with warming trays were set up and we were given plastic plates and utensils to plate our meatballs with the various little garnishes. The meatballs that were presented were all ethnic in origin, that in itself was very interesting. As everyone knows my cooking classes were all based on the ethnic cuisines of the world. I love different flavors and love to explore them. The person who received the 1st place was from Spanish/Mexican heritage and her meatballs expressed her background. I love the fact that she cooked them in smashed Tomatillos and proceeded making an amazing sauce at the end to be served with her pork meatballs. The second place went to a person from an Asian country….I cannot quite remember exactly where she was from. She received her recipe from her father who marinates meats in a special marinade for several hours. The meat balls were tasty, but her presentation was a work of art, beautifully done and very pleasing to the eye. 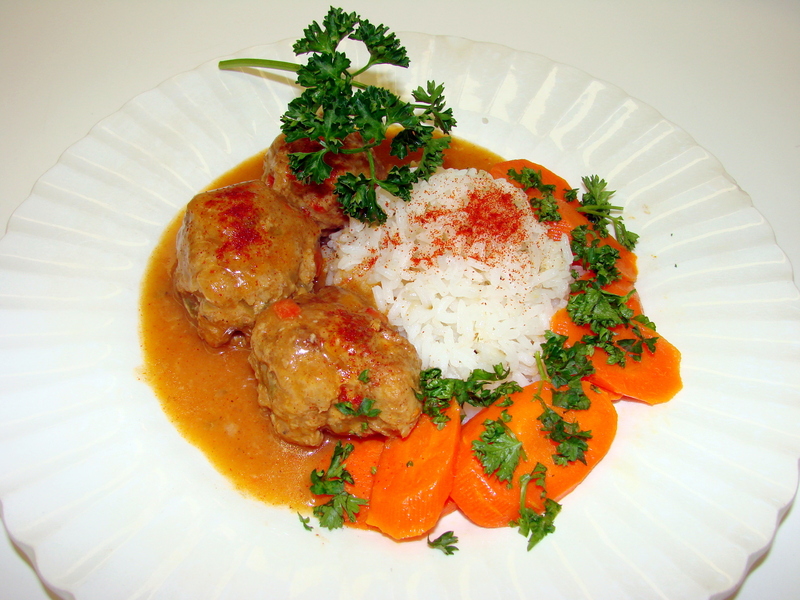 I received the third place with my Austro/Hungarian Paprikasch Meatballs. Well, I was told that there was a very close count between the second and third spot. I really did not mind at all, since I received rave reviews from my friends and family while I was experimenting with the recipe prior to the competition. Today I am sharing my recipe with all of you and hope you will like it as much as my “home team” in Maja’s Kitchen. This recipe was inspired and came from an Austrian/Hungarian meal. 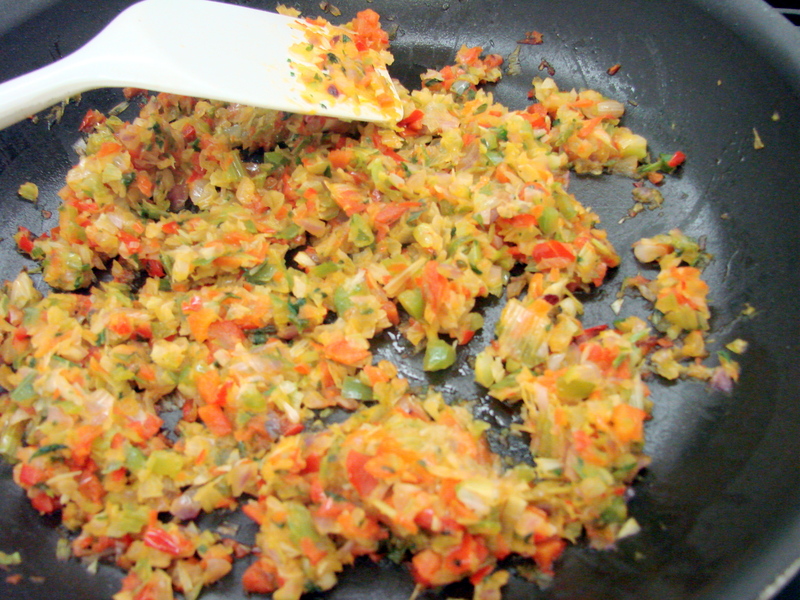 Paprikasch is a dish that is very common in every Austrian and Hungarian household. In essence it is a chicken stew with either a clear broth or a creamy sauce, and is traditionally served with either noodles or Spatzle. 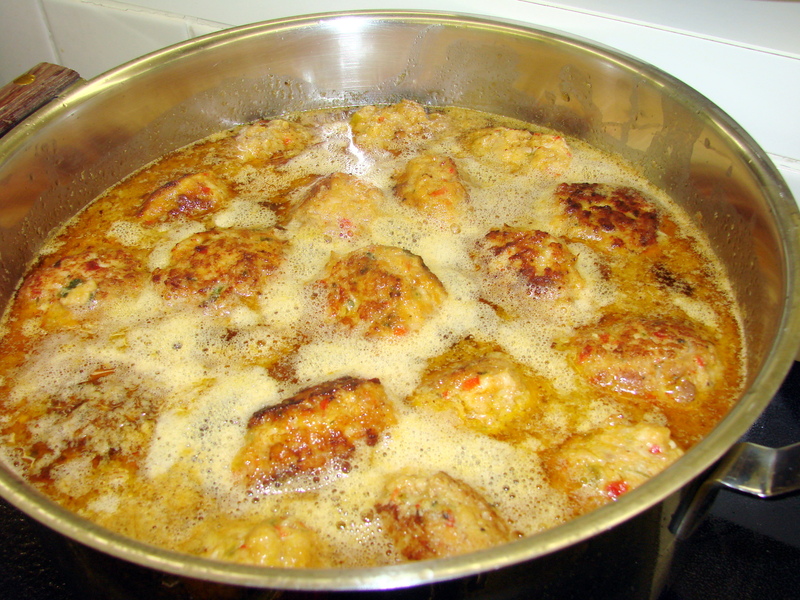 I took all the ingredients that would otherwise go into the pot with the chicken pieces and added them into the ground chicken thighs/meat to make the meat balls…. the 2 Tbsp olive oil…..until most of the water is evaporated and the vegetables start to brown….take it off the stove and cool to room temperature. In a big pot add 8 cups of water and 4 Tbsp of McCormick’s chicken base. Place the ground chicken meat into a large bowl and add the Montreal Steak Seasoning, the sweet and hot Paprika, the 1 cup of unseasoned bread crumbs and the 2 jumbo eggs. Now add all the cooked vegetables and mix everything thoroughly together. I like to use plastic gloves when I mix these ingredients. In a medium size frying pan add the olive oil and let it heat up slowly, and while the olive oil is heating roll the meat balls from the chicken mixture you made before…….any size you want them to be. I like them to be about 1 to ½ inches in diameter. Brown the meat balls on both sides to a nice brown color. They will not be completely cooked through, however when they are nicely browned transfer them with tongs to the simmering broth. This is where they finish cooking. Simmer them for about 30 minutes or so, then transfer them with a slotted spoon to another pot….and,with the remaining broth make the sauce. 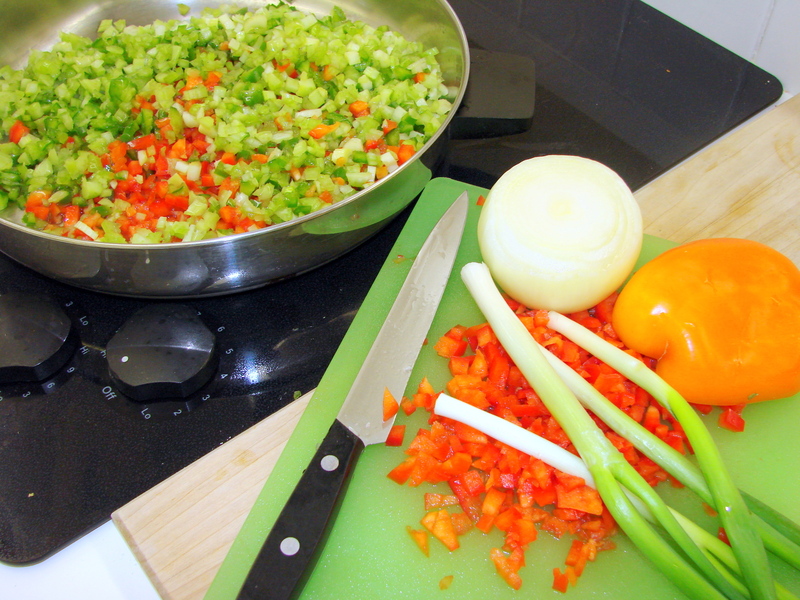 Measure the broth and add enough cornstarch to thicken it…. (1 cup of liquid + 1 Tbsp cornstarch will make a thick sauce)…. To incorporate the cornstarch to the broth use a little cold water to make a smooth paste with the cornstarch….. before you add it to the hot broth, bring the broth to a medium boil while you pour the cornstarch paste into the liquid. Using a whisk keep stirring constantly to prevent the starch clumping up in the hot broth, and keep stirring until the broth thickens. When the sauce is thickened add the sour cream. It is up to you how much or how little of the sour cream you want in the sauce. Again, mix the cold sour cream with a little of the hot sauce…and mix well…then slowly incorporate this mixture into the rest of the sauce. Season with salt and pepper and add more Paprika if you wish. I have served these delicious little balls with plain rice and sauteed carrots. 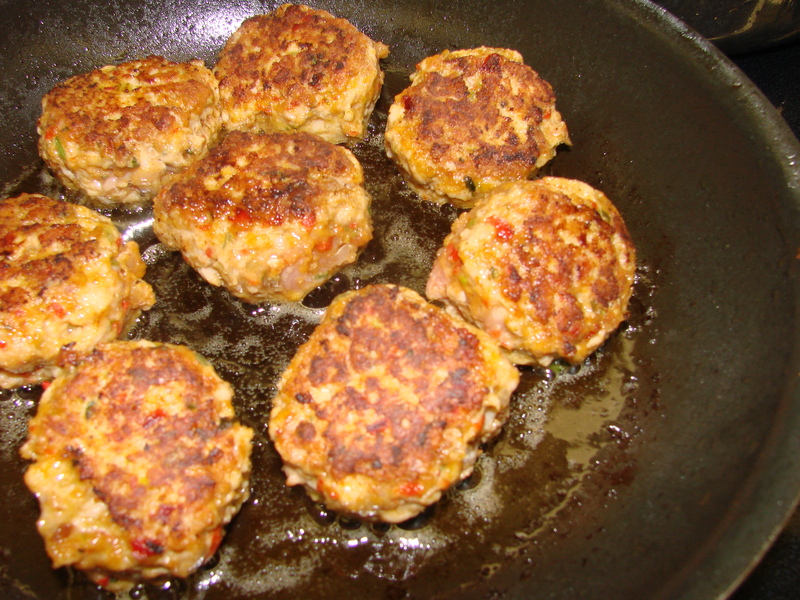 Do chicken meat balls as a Paprikasch sound interesting to you ….or not? Thanks for another great recipe!!!! These meatballs look wonderful!!!! I’m going to make them for a potluck dinner for a ‘Big Chill’ weekend with childhood friends. You can make them well in advance and freeze them…When you thaw them out…bring them to a simmer and add a little more cornstarch to thicken the sauce…..Cornstarch disintegrates during the freezing and thawing process…. Maria! This looks absolutely wonderful and I am DEFINITELY going to make it very soon! Thanks for sharing it with all of us! ~ Mel. I am definitely going to try these. Meatballs is such a comfort food and these sound a little spicy and different. Hi Claire….thank you for commenting…it is always great hearing from you….and I LOVE your blog….you are so informative about gardening and the bees….love it! 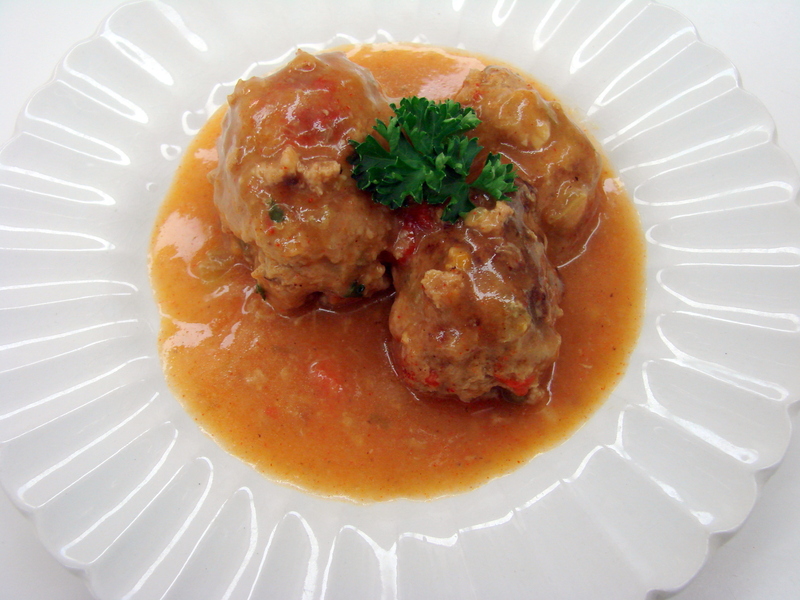 Mel….I can hardly compete with all of your wonderful recipes…but, this meatball dish is quite good…it freezes well….only the sauce needs thickening again after thawing……hugs to you! Thanks for sharing this unusual take on Paprikas Chicken. As a Hungarian I had to adjust my thinking a bit because Paprikas Chicken at our house meant using bone in chicken thighs which make their own sauce that also thickens as it cooks, so no corn starch is necessary. We use liberal amounts of chopped onion and garlic, also salt and paprika (I like to use both sweet and hot). Nothing else goes in until the very end when I add the sour cream. We did not use tomato or bell peppers at our house in either of the two chicken dishes you mention.The other dish you refer to is called Porkolt Chicken which is braised chicken without the sour cream, a more spicy dish..
My American daughters-in-law often make Paprikas chicken for their families. Trust all your friends appreciate your creativity in coming up with this new dish; however, it would be quite a bit of extra work for me to make it. Hallo Maria, I love Chicken Paprikas. I haven’t ever tried it with meatballs, but will definitely try this recipe. I am certain it will be superb, like all of the rest of you recipes. I love getting your recipe’s and llo so forward to your sharing the memories you associate with them. I think this looks really good! 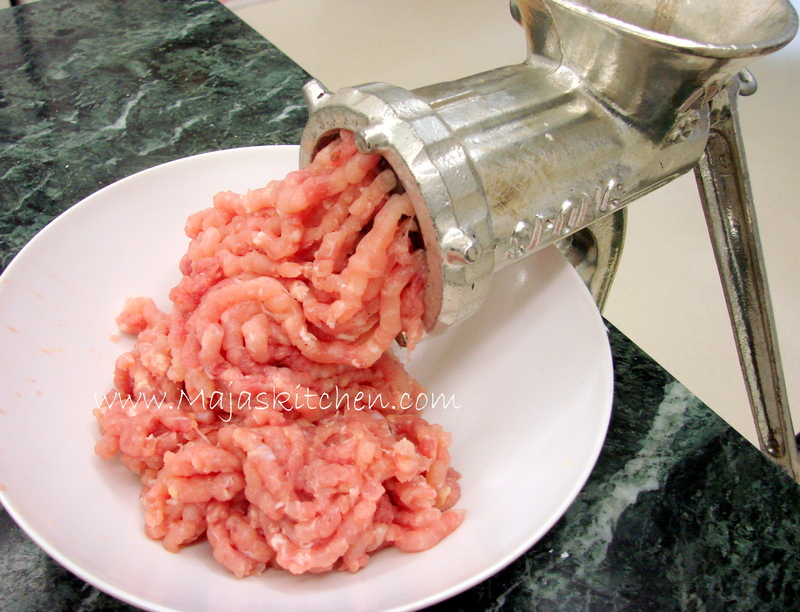 Can you get ground chicken in the store or do you have to have a meat grinder? What is the difference between sweet Hungarian paprika and regualr paprika? Hi Stephanie….thank you for stopping by….and yes, you can use ground pork, or ground pork mixed with ground veal….or ground turkey…..I prefer the mix of pork and veal however…. There is sweet and hot Hungarian Paprika that is imported from Hungary….but McCormick’s works well….from what I understand the peppers that McCormicks uses is grown in Spain….it has a nice deep red color and that color is important in this dish, beside flavor….Depending of how much sauce you have at the end…making that sauce a nice red color …just keep adding paprika to it until it has the right color…Paprika loses its color with time, especially if you keep it out in the open….I keep the spiced I use for cooking in my pantry.